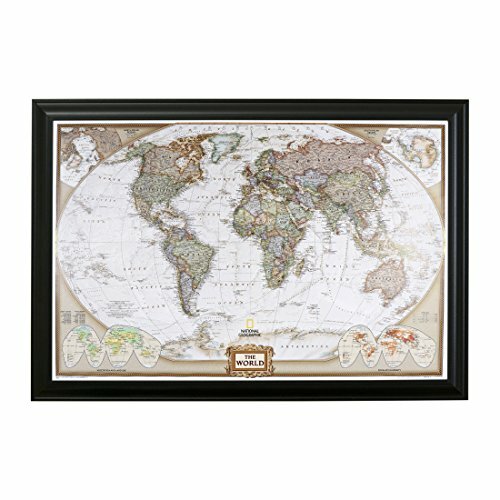 Our Executive World Travel Map is a stylish way to decorate any wall while displaying your life's many journeys. Pin all of your past travels and plan out future destinations. Our maps are all handmade right here in the USA and are the perfect way to share your adventures with friends and family. The experts at National Geographic have designed this exceptionally detailed up-to-date map in rich colors that give it a unique antique look that will match almost any décor. The ultimate conversation piece, this map is perfect for any home, office, classroom or business. The map is mounted to sturdy foamcore board and professionally finished in a classy 2" smooth glossed black frame to ensure it makes a splash on any wall. The completed size of the framed map is 39.5" Wide x 27.5" High. Each map will arrive ready to hang with a mixture of 100 pins in red, white and black to get you started. Use each color according to your own preference. Our Executive World Map matches perfectly with our Executive United States Map, making them an elegant pair for those who cannot decide between a world or US map. Our Push Pin Travel Maps are a unique and fun gift for the traveler in your life for any occasion. Order your Push Pin Travel Map today and start pinning!